We put maps accompanying the 6 ROUTE BOOK WALKS online via google maps and pasted them here below. A walk from Abbey Gardens to Lea Bank Square moving the trolley which houses the seed bomb press. The press is used in the making of the seed bombs used on the Sunflower Avenue walk. 'Printers Paradise' was the informal name of the dense cluster of printers and related industry spread around the Wick and along the Carpenters Road. Map showing location of printers, finishers, litho and repro in and around Hackney Wick covering those that exisited in the 'heyday' of the mid 1980's- 1990's to present day. Mapped from personal accounts, aural histories and research gathered from those still operating in the area and from those who have moved out. Over the last month we (public works) have been busy developing and pitching ideas that are concerned with establishing Curiosity Shop projects in Hackney Wick. Not all were successful and will not be taken further in the way they were first articulated. The ideas linger on and will work themselves into future projects, ideas and ambitions. Just to mark the point when they were first articulated I thought I publish two of them here - WICK WICK WICK & SWEET FACTORY - to make them public and for future reference. - We propose a large column on the land next to the footbridge crossing the A12 motorway. The column acts as a sculptural landmark and as infrastructure for a collaborative process to activate the land on which it is found. The Wick Column is the main focus of this submission but needs to be understood in context as it is integral to the following elements that make up the overall proposal. - We propose to make land available for a potentially longer term collaborative project the outcome of which (together with the column) will ultimately become the final landmark along the Wallis Road route strongly embedding it into Hackney Wick and its rich culture and history. - We propose the Wick Curiosity Shop as an independent organisation with the specific aim of initiating and facilitating local collaborations. These collaborations will contribute to shaping the land ultimately create a living landmark that captures the collective imagination of Hackney Wick. The Wick Wick Wick proposal is a direct continuation of the 'Wick Curiosity Shop' (http://wickcuriosityshop.net) and the 'Route Book' project, which is part of the same series of the 'Made in HWFI' commissions. For centuries Hackney Wick has been a place of production - initially agricultural then industrial and lately increasingly cultural. Before its recent phase of development Hackney Wick provided a remote space and a rich environment for a wide range of often alternative cultural practices. Space was cheap and available while the centre of London was close by but also far enough away. A post industrial landscape sometimes forgotten and abandoned with enough gaps and cracks for experimentation with cultural production, slightly removed from the confines of a rich capitalist city. All this is changing rapidly - the 'wilderness' of workshops, yards, overgrown green spaces, disused race tracks and artist studios is disappearing. The 'service based' culture of the big City is arriving and Hackney Wick is being tidied up and brought in line with the rest of London. At the dawn of this new era there are numerous attempts to preserve, acknowledge and reference the rich culture that is associated with Hackney Wick and Fish Island. The area inspires and excites but there are few places where these efforts come together in a combined expression. Within this context we are proposing an ambitious project that attempts to bridge the layers of history and the numerous cultural practices that are currently occupying Hackney Wick and Fish Island. As a practice Public Works are committed to continue our long term engagement with Hackney Wick and its occupants to establish a collective space for shared cultural production which bridges this period of rapid transformation. At the same time, Wick, Wick, Wick is attempting to lay a seed for the time beyond the Olympic Games when national and international attention and resources move on, leaving the Wick clean and tidy, having to make sense of the major interventions that took place. We are proposing a place where - for a long time to come, its roots are still visible as an 'active monument'. The Wick Column is the first piece of the puzzle. A one meter wide and app 12 metre high round column next to the footbridge crossing the A12. The column is situated at the bottom of the ramp on the green piece of land that stretches along the motorway (we call this piece of land the Wick Triangle). The column will act on a number of physical scales and levels. At the foot of the column is a small multifunctional room - The Wick Curiosity Shop - which can generously open up towards the land and to the streetscape. The room is slightly elevated and sits on a raised platform. Towards the street the opening of the room is covered by a large communal billboard, which can slide vertically to give access to the space via a counter creating a kiosk-like environment. 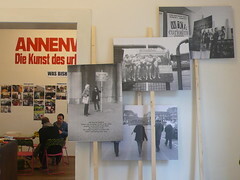 This environment can host small-scale exhibitions or events as well as providing basic street furniture. The opening towards the back faces the Wick Triangle and consists of two large hinged doors. When open the space overlooks the land and due to its slightly elevated nature can act as a perfect stage. At bridge level the column will connect to the footpath and will act as a sheltered viewing platform looking into the Wick. Above Bridge level a large light board will display 'Hackney Wick' in large letters. It can also be used advertise public, cultural activities taking place in the Wick. Placed at one of the gateways into Hackney Wick the column will be highly visible to the cyclist and pedestrians moving in and out of the Wick as well as to the transient audiences that pass via car and train (A12 motorway and North London Link). One aim of the overall proposal is the transformation and appropriation of a piece of land by initiating a series of bottom up collaborations that will transform and shape the site. The land will be offered to the occupants of Hackney Wick as a ground for cultural production mediated by the 'Wick Curiosity Shop' (see description below). Each collaboration will focus on Hackney Wick's rich culture both contemporary and historical and will shape the site either temporarily (events) or permanently (interventions). We propose to open up the land to anyone who wants to work with us and allow them to take an active part in the project by joining the Wick Curiosity Shop. The musicians, film makers, graffiti artists, cooks, painters, publishers and fish mongers, flee market and festivals, screenings and concerts etc … By offering this common ground as a collective asset we hope to engage and draw from the rich social dynamic in Hackney Wick to shape the project and the space. To visualise what could happen we have taken two speculative examples from our current involvement in Hackney Wick and bluntly projected them onto this proposal. A) Hackney Wick has an active guerrilla gardening scene and has numerous ambitious gardening projects in close vicinity (edible forest garden, manor garden allotments, Abbey Gardens, etc). The footbridge and the 'Wick Triangle' also mark the beginning of the 'Sunflower Avenue', a local initiative to grow a connection between Mabley Green and Victoria park by planting Sunflowers along the route which cuts straight through the heart of Hackney Wick. Our current Commission 'Route Book' is working closely with gardeners from Hackney Wick to trace the route of the ephemeral Sunflower Avenue and reseed it using seed bombs produced with the local community. As a possible scenario for Wick Wick Wick we would propose to work with the LDA and its current planting scheme for the site and match it with the local desires, ambitions and techniques for greening the Wick. This would build on local resources and imagination to grow and sustain greenery on the Wick Triangle, while at each point leaving space for possible future use by other collaborations. B) Local historians have taken an active interest in Hackney Wick. We have started working with Wiggy Wilson who grew up in the area and who's father was a member of the Eton Manor Boys Club. Over the last years Wiggy Wilson has lead numerous walks around the Wick retracing the history of the Eton Manor boys club and the involvement of the Etonians in the area. The work with Wiggy Wilson and other local historians (e.g. Lisa Rigg from the Hackney Society) could lead to a library or wall of walks through the Wick housed on the land or on the outside of the column itself. Each engagement would leave its trace, some small, others bigger. Over time a layering of projects would occur which gives form to the space and constructs a network of relations and stakeholders. Very much in the spirit of Kurt Schwitters Merzbau. 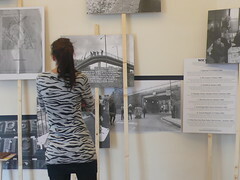 We propose to set up the 'land engagement' for 3-5 years after which it should be reassessed and either enter into a new phase or conclude, in which case the legacy of the project would be a detailed archive that can be housed inside the column or become part of the official Hackney Archives. 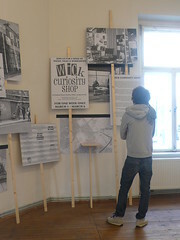 The Wick Curiosity Shop (http://wickcuriosityshop.net) is a small scale archive and cultural space dedicated to the specific locality of Hackney Wick and Fish Island. It aims to document, host and promote. The project was originally commissioned by [SPACE] for the Hackney Wick Festival in September 2008. It is a collaboration between public works and Hilary Powell. For Wick Wick Wick we are proposing to expand the Curiosity Shop into an independent smallscale cultural organisation to support the project, lead by public works with a steering group and open to anyone who wants to take an active part. The main focus of The Wick Curiosity Shop will be to create and facilitate a platform for collaborative cultural production dedicated to the specific locality of Hackney Wick and Fish Island. In addition the Wick Curiosity Shop will continue to create a growing archive of 'Curiosities', an eclectic collection of local produce, memorabilia, oral history, songs and stories from or about Hackney Wick that are collected along the way and which will be housed in the 'kiosk'. Working on the scale of the artefact and the land at the same time, the Wick Curiosity Shop will present a narrative understanding of the area. A space full of stories about the Wick told in a multitude of ways. It is an archive of local cultural activities and interventions that help to document the process of change in the area with the close involvement of its local residents. It allows existing histories to be collected and new memories to be formed, thus capturing the life of a community in transition through a series of close engagements, which will manifest themselves in the Wick Triangle, at the Column and in the collection. Contributions to the Curiosity shop cannot be made from afar. Based on the principle of direct involvement only those who get actively involved can join in. Sweet Factory is a proposal to set up a small scale sweet factory and shop in one of the host boroughs in order to produce sweets and explore the historic and contemporary narratives surrounding its production and consumption across the 5 host boroughs. Sweet Factory will establish a small scale local production of sweets. It will draw from the wide variety of sweets consumed or remembered by the many different cultures living in the 5 host boroughs today, recreate them and offer them for consumption at the factory outlet and at local events across the 5 host boroughs. Leaving behind the nostalgia associated with traditional candy shops, The Sweet Factory will be a 21st century interpretation of a sweet shop offering home made sweets made with recipes from local residents and produced where possible from locally sourced ingredients. It will (re)introduce a small-scale candy production and invent new varieties alongside revisiting well-established recipes. From Poplar Salty Liqurice (referring back to early Dutch settlements in the area), to Bangladeshi Pumpkin leave candy, social histories and tastes can be explored via the shared production of candy. The project will engage with communities and participants across the host borrows both vie the production of the sweet as well as disseminating them by visiting local food events such as Harvest Festivals, local Markets and others. The Sweet Factory will be based around a specially designed temporary structure. It will consists of a production space and a social space (sweet shop) where the produce will be on display available for consumption, meetings can take place and the different narratives can be displayed, overlap and unfold. We are planning to directly engage and visit food growing projects located in the host borrows to source possible ingredients, visit sweet makers in the areas and source recipes by directly getting in touch with local community groups and individuals that want to participate in the project. We will invite professional sweet makers to share their knowledge as well as amateur candy makers to contribute in the making of the produce. 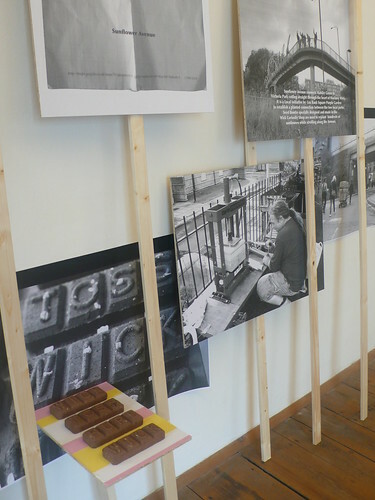 The project will also look at the history of sweet production in the areas from the Carnico Factory in Hackney Wick to the Tate and Lyle's sugar refinery in Silvertown and the historic sugar bakeries that were scattered all over the east end and which employed many of the immigrants that newly arrived in Britain. The project will be accompanied by a Website which will publicize the project as it develops. If the budget allows we would invest into a small mobile vehicle to give us a base when traveling across the 5 borrows. Sweets are an indulgence. They are not a necessity. We want to work with the delight and pleasure that sweet teeth can offer to engage with the host borrows in a project of collective production, exchange and invention. Not only of sweets but also of a joint narrative. Is an artist from Hackney Wick Fish Island like a Melton Mobray pork pie with special geographic status? - who writes the brief for public art in HWFI and what should it say? - should HWFI public art opportunities be available only to HWFI artists? - should the new public realm in HWFI be designed for local artists to exhibit their work? - should HWFI have any public art at all? The debate will examine the feasibility of a homegrown public art for Hackney Wick and Fish Island. 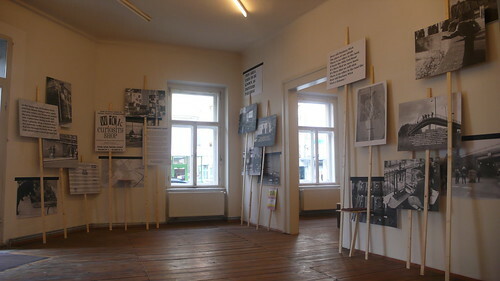 The aim of the debate is to establish shared ideas from which briefs can be written and local or other curators, nominated or self selected, to commission a number of small scale temporary works for Hackney Wick and Fish Island that address the plans for ongoing regeneration in the area and explore the issue of local provenance. From documentary to fiction and the bits in between - an afternoon of films featuring Hackney Wick as the main protagonist. Stories of pleasure, discovery, loss and celebration providing a cross-section of the transformation taking place in Hackney Wick. Edgeland is a film by artist Sally Mumby-Croft, co-directed by Xavier Zapata. Shot entirely around Hackney Wick it uses voice overs from local people to creating a great introduction to the Wick area and the many changes it is facing from the ever encroaching 2012 Olympic Developments. A film by Hilary Powell made in 2007 before the arrival of the ubiquitous blue fence. A surreal alternative sporting event inspired by the DIY nature of the 1948 London Olympics, 'The Games' sets its athletes loss on a crumbling Hackney Wick which was about to be lost forever. "A road movie for a road that was never built". A film by David Knight following the Northern Outfall Sewer which heads east from Hackney Wick. Better recognised as the Greenway, this path was long known as an escape East away from the city and its rules being overtaken by nature, mopeds and graffiti. A film by Dave Hill, Francesca Panetta and David Levene which looks at people and places which make up the stories behind the areas where the Olympics will be taking place. A prize winning film from Mark Aitken and young film makers from polkadotsonraindrops which follows the story of the Manor Garden Allotments which struggled to hold their own before being demolished in 2007 to make way for Olympic projects. Two clips from BBC News covering demolitions on the Trowbridge Estate in Hackney Wick, the initial blast was unsatisfactory and became known as "the leaning tower of Hackney". 'The Pub of The Future' a clip from Tomorrow's World featuring trials of automated drink ordering system at a pub in Hackney Wick. The pub in question was the Victoria (Hotel) on Eastway. Harry Meadows' film of his first Coracle Regatta project which took place on the Cut outside the Eton Manor's Johnstone Boathouse. The site of the traditional 'Christmas' swim, the artificial waterway continues to host this informal boat race which, coincides with the annual Hackney Wicked Festival, until 2012. The story of the Lea Valley River area as it prepares to be forever changed by the 2012 Olympics directed by Paul Kelly in collaboration with St. Etienne. A celebration of an area which saw the invention of plastic, petrol and the formation of the Labour movement, the film depicts a young boy cycling around the area on the day the Olympic decision was announced. Filmed and directed by Paul Kelly, produced by Andrew Hinton, music by Saint Etienne, written by Kevin Pearce and edited by Mikey Tomkins.